"What no wife of a writer can ever understand is that a writer is working when he's staring out of the window." As most of you have come to know by now, I can be a veritable quote machine at times, but this one definitely ranks high on my all time favorites list. If we forgive the gender bias of the language Rascoe employed, I think this is one of those universal chunks of aphorism that make writers of nearly every size, shape, and genre say, Yes! Someone understands! I've done a bit of preaching here and there on this blog about organization and work ethic. For the most part, I think I've made it clear that I believe writers should approach the craft as professionals if we want to be successful at this—that is, we should treat writing like a genuine profession, not some fleeting weekend hobby. And I absolutely believe that's true. The written word is serious business, and it demands equal parts ardor and diligence. But sometimes it's important to stop and remind ourselves that we're not punching the clock and filing into a cubicle when we write. We are engaging art, and damn it, sometimes that means staring out of a window. Sometimes it means closing your eyes and listening to music, or going for a walk at night and looking up at the moon. These aren't usually the kinds of things you can pencil into a work schedule, but they can do wonders when you let them. It seems obvious, I know. Hell, it's practically a stereotype: the aspiring writer sitting on the edge of a pier with notepad in hand, staring off into the sun as it sets over the ocean. But usually this image is colored derisively, as though writers, poets, painters, and any other artsy-fartsy types are just slackers in disguise. That's what Rascoe was referring to with his generalizing jab at the spouses and partners of the writerly ilk. If you're not someone that spends the better part of your day chasing the muse, it might be difficult to understand how relaxing in a hammock, watching a good movie, or playing a mindless video game can contribute to anyone's 'work.' Most people do these things to escape demands and responsibilities, not to nurture creativity. But there's no reason you should feel bad for engaging in a little recreation and reflection from time to time. These moments really can grease the wheels of inspiration if you let them (and as long as you don't overdo it). So the next time your better half catches you staring into the distance while you're supposed to be working, just direct them to Mr. Rascoe's words of wisdom. And better yet, don't be afraid to remind yourself to stop and listen to the churning of the universe every now and again between writing sessions. Hard work will always pay off in the end, but so will the occasional ruminative interlude. Thanks for this! As someone who has over greased the wheels of inspiration for far too long, I needed to be reminded that there should be discipline involved in my writing. No problem! I think we all need a kick in the pants from time to time. But don't forget to stare out of a window from time to time as well. Inspiration is important, and can come from odd places. Daydreams are vital! "We are engaging art, and damn it, sometimes that means staring out of a window." I'm not a daydreamer (because I'm hyperactive), but I watch movies and cartoons "for work" ever since I was a kid. It started out with questioning the motives of Tom to chase after Jerry, moved on to analyzing how exactly Home Alone worked so well, then on to how scripts are written and what the differences are to novels. I won't even mention that all other things (like reading any and all non-fiction and watching documentaries, being in crowded places or traveling) is always "work" for me. So yeah, I totally agree with this. If we're really serious about writing, if it's in our blood, we're always working, always creating or analyzing fiction. I'm not really the daydreamer type either. I need constant stimulation of some kind, so it's usually movies and video games that end up inspiring me, though there is the occasional bolt of inspiration in bed. Oh, and I do the same thing. Sometimes I can't help but rewrite the scenes I'm watching in my head! The missus doesn't complain about it much though. Inspiration can be spurred on from many sources. My "window" is often my computer screen--sometimes distracting, but often a source of great inspiration and invaluable information. I'm with you on that one, Arlee. I definitely spend more time staring at screens than windowpanes. My spouse doesn't understand that I need about an hour of quiet to get in writing mode. You have my sympathies, Tonja. I hope you can bring him around! Thanks for the comment. I don't know if my husband understands that I'm writing when I'm just staring out into space. I sometimes think I'm just procrastinating, lol. The internet is my biggest hurdle. There definitely is a fine line between inspiration and procrastination, and we have to be careful when walking it. That's one of the reasons my comments tend to focus on the discipline side. While the gender bias is, quite frankly, offensive, I'm very lucky in that my husband totally understands. He knows that gazing out of the window, pacing around, drumming my fingers and groaning are all parts of the creative process! I actually considered editing the quote to make it gender neutral, but I ultimately figured that would defeat the purpose of quoting in the first place. I suppose the bias might be a sign of the time, or at least I'd like to think so. I couldn't find a date for it, but Rascoe most likely said it sometime in the twenties or thirties. Glad to hear your husband is supportive of the process! Thanks for reading, Angeline. I thought this was a really awesome post!! My kids and husband have come to learn that me being off in lala land sometimes (okay, most of the time haha) is just part of me being me. A writer. Thanks, Tamara! It's great that you have a solid support system around you; that's such a huge help. It's tough enough to wrestle with the empty page without having to battle your loved ones as well. Thanks for the comment, and thanks for following! Great post, and so true, sometimes it needs that marinating time! Wonderful post! I've always considered going for a walk or listening to music or staring out the window perfectly good ways to "refill the well" but I tend to beat myself up for watching movies and playing on the internet as "wasting time." Thanks for the different perspective and for stopping by my blog! Your comment was much appreciated. Refilling the well is important. I only beat myself up for movies and the like if it intersects with my scheduled writing time. I always do my best to set aside time to take in inspiring activities of some kind every day. No problem, EK, and thanks for your comment as well! I love this quote! I feel like I am always "working" on writing, even when I am not in front of the computer. My brain is always chunking away on plot problems, etc. I am very lucky in that my husband is super supportive of all writing time, whether I am daydreaming or sitting in front of my computer. That's the great thing about writing. The real first draft is in our heads before it ever makes it to the page, and we carry it around with us at all times. Great to hear that your husband supports you in your window staring. Darn it woman, I'm working here! Turn that TV back on. That probably wouldn't go over so well. The guitar can be very meditative, especially if your well-practiced. Unfortunately, I'm not these days. I'm terribly out of practice, which I'm always meaning to correct but rarely finding the time for, unfortunately. . .
Love this! Way to go for being uplifting. :) Non-writerly people don't get us. I can be working when staring off into space. Yeah, I do that, a lot. 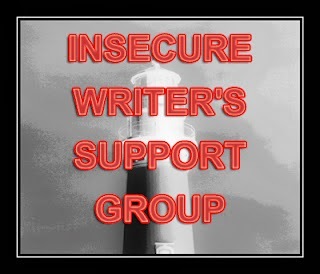 Great IWSG post! Thanks, Candilynn! Not only can we carry our work around with us in our heads, but if you're anything like me, you probably find it hard not to. Some of my best thinking time is during my one hour commute to my "real job." The only thing that interrupts me then are the other drivers or deer. I have to leave early so I can write all my ideas down before clocking in. I think that's the best way to put those unavoidable moments of drudgery to use. Make them work for what you'd rather be doing! Yeah, that quote is definitely going to the top of my list. Lol! Nothing wrong with that! Though most Norwegian metal tends to make me want to thrash instead of write. I confess, I'm a window starer-outer too! Plus, as my kids would put it, "When Mom gets that distant look in her eyes, don't bother even talking to her. She's either killing someone or developing a new twist for some story." They are so supportive and with their help I was able to put in the hours I needed to finish my first book. That sounds great, Lucie! It's great hearing from so many people who have supportive families. It's so important. The next time I feel guilty about not writing, I will remember that quote! It is so true. When traveling to visit relatives, the road trips are long, but I'm still working while he's driving. Tim says, "What are you thinking about?" Diane says, "Shh, I'm working. And it's not called thinking, it's compiling." Road trips are excellent sources of inspiration. Pretty much any activity where you're forced to sit and think--er, compile for a while works wonders. I have a long road trip coming up for Christmas that I'm looking forward to. Hopefully I'll come back with several story ideas. I'm caught staring off into space all the time, or jotting down notes in notebooks or on the back of receipts all the time. I know writers get it. Great post.